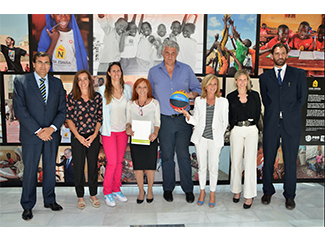 Humana, Alcobendas Foundation and FEB 2014 Foundation (Spanish Basketball Federation) have signed an agreement for donating € 25,000 to Casa España Comprehensive Training Center in Bel Air Hann, Senegal, home to 330 children from disadvantaged families. Part of the funding for this training center comes from Humana resources generated through management and recovery clothing collection in Alcobendas. In fact, this is one of the municipalities in which the Foundation collected more clothing each year (300,000 kgs), thanks to the hundred through existing containers. Therefore, Alcobendas got one of the prizes of the IV Humana Textile Recycling Awards , delivered on the occasion of Humana Day 2013. In the act of signing the agreement have participated Ignacio García de Vinuesa, Major of Alcobendas, and José Luis Sáez Regalado, president of the Foundation FEB 2014 , and Amaya Valdemoro, Fernando Romay, Jorge Garbajosa and Pilar Aventín, Humana Collection Madrid Manager. During his speech, Garcia Vinuesa, highlighted the work of Humana in the field of textile recycling and called on all citizens to deposit their used clothing in appropriate containers. 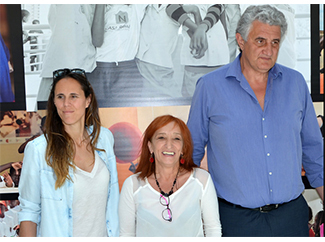 The Casa España Center for Integral Formation working beyond education in areas such as health, food, adult literacy and sport, with particular attention to basketball.